Avoid dangerous ladders with Unger's revolutionary nLite high access water fed pole systems for pure water window cleaning! 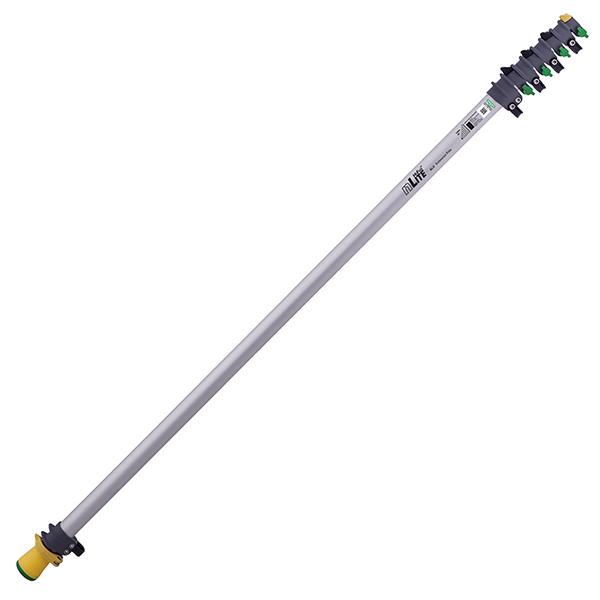 Safely clean upper-story windows from ground level with these strong, lightweight window cleaning poles that don't compromise on rigidity. Extension Poles, which include yellow and red visual warnings to prevent unintentional separation, attach easily to Master Poles to reach lengths up to 65'. Worker Safety – No ladders needed! For most applications, the dangerous use of ladders is not necessary – this results in safer working conditions for cleaners. PureWater Cleans Without Chemicals The use of PureWater eliminates the need for harmful cleaning chemicals. This results in a safer, chemical-free workplace for cleaners and no harmful chemicals destroying our environment. Green Cleaning! Waterfed Poles Increase ROI Over Lift Rentals Renting a lift is an expensive recurring cost to get the jobs done. Investment into a HiFlo PureWater System with extension poles for high access window cleaning does not incur major additional costs and can be used for years. Insourcing vs. Outsourcing Your Cleaning Jobs With inexpensive operating costs, insourcing your window cleaning equipment using the HiFlo PureWater Cleaning Systems has a very attractive cost-saving potential.